Johnson Custom Garage Door is a full-service garage door sales, repair, service and installation company based in Suisun City, CA. We’re licensed, bonded and insured. We handle jobs of all sizes — from programming a remote-control to replacing double garage doors. Richard Johnson owns and operates the company. Richard started servicing garage doors in 1976. He went into business for himself in 1983 — and has been serving garage door customers in and around Solano County ever since. Johnson Custom Garage Door is a preferred service provider for homeowners, realtors and contractors needing service on residential garage doors. Johnson Custom Garage Door prides itself on timely service; careful, precise repairs; and responsive customer care. From preventive maintenance to emergency repairs, Johnson Garage Door is committed to making sure your garage door opens, closes and operates at the push of a button, so you and your home stay secure and unimpeded in your daily routine. Common garage door services we perform include torsion spring replacement; opener repairs and installation; new rollers, cables, tracks and hinges; new seals and insulation; opener motor repairs; sensor alignment; remote control sales, programming and keypad installation. Need new remotes or programming? Give us a call. We’ll lump those services into the price of a garage door service call. The visit will include a garage door preventive maintenance check and service, plus the cost of any new remote controls you might need. Johnson Custom Garage Door offers not only repair and service. We can show you a broad selection of new doors. That includes metal, wood glass doors, as well as deluxe styles like Carriage House. Sources for our garage doors include reputable industry heavyweights like 1st United Door, Amarr and Clopay. 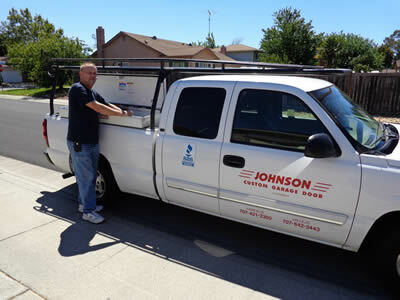 Johnson Custom Garage Door has installed thousands of garage doors — and has an extensive history of satisfied customers. We service products from many other well-known manufacturers, include Chamberlain (Liftmaster), Genie, Linear, Marantec, Craftsman, Wayne Dalton, C.H.I. and more. We sell and install Liftmaster openers/motors. Johnson Custom Garage Door serves all of Solano County, including Suisun City, Vacaville, Fairfield, Dixon, Vallejo, Elmira, Batavia, Winters and more. We also serve southern parts of Napa County, including American Canyon and Napa, and northern Contra Costa County, including Martinez, Antioch, Walnut Creek, Pleasant Hill and Pittsburg. We hope you’ll call us for garage door service in Solano County. If you do, you’ll be hiring a mainstay company with a great track record and a commitment to producing yet another happy customer.